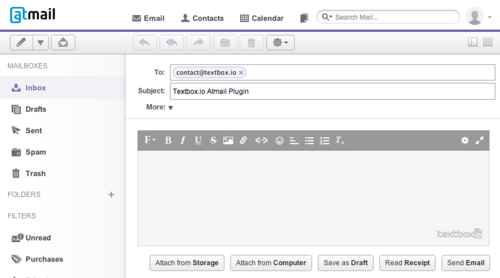 We are proud to announce the availability of the Textbox.io Plugin for Atmail. This plugin upgrades the default Atmail email editor with a ton of great features. The Textbox.io Plugin for Atmail is now available to download and try. For access to a demo server with Textbox.io already installed, contact us. Installation is easy. Download the Textbox.io Plugin for Atmail, then upload the package in your Atmail administrator console. Once enabled, your users will immediately have access to Textbox.io via Atmail’s web interface. Upgrades are seemlessly deployed to your users, as Textbox.io is cloud-delivered. There’s nothing to do on your part – users will automatically recieve the latest Textbox.io features and fixes. Right now Textbox.io runs in Chrome, Firefox and Safari. We will add Internet Explorer support soon but for now unsupported browsers will default to the basic Atmail editor. Textbox.io is free whilst in beta. Pricing for the final release has not yet been determined so please contact us for more information. UPDATE: the Textbox.io Plugin for Atmail was discontinued.